Below are just a few of the pieces that we’ve photographed inside YesterTec’s factory. 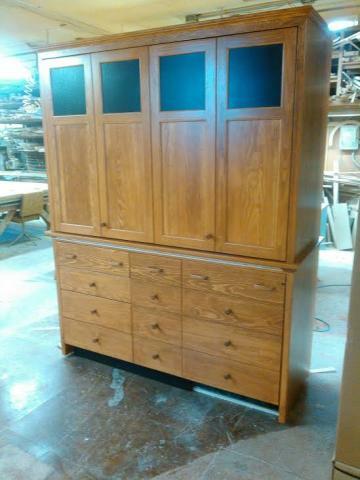 Though they are not complete, most show some unique features that aren’t shown anywhere else on our site. And by the way, YesterTec doesn’t own the factory, the mill-work company that builds most of our products is independently owned and located near YesterTec’s showroom and headquarters. But since we are so intimately involved in it on a daily basis, we do think of it as our own factory. 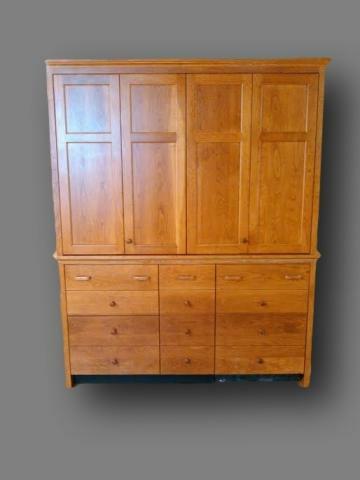 Two images above: SZ15-RP-81 Refrigerator / Pantry This Colonial Pine Armoire conceals a Liebherr 9 CF refrigerator / freezer and lots of other storage space. It can also be built to conceal a Subzero 700 series 15 CF unit, but the Liebherr saves almost $4000.00, and for these customers, the Liebherr was big enough. 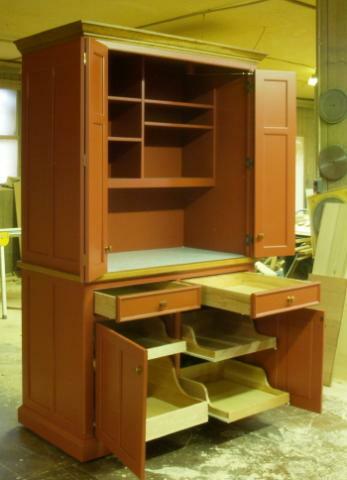 This WP54, painted Ox Blood, shows it’s typical storage features. 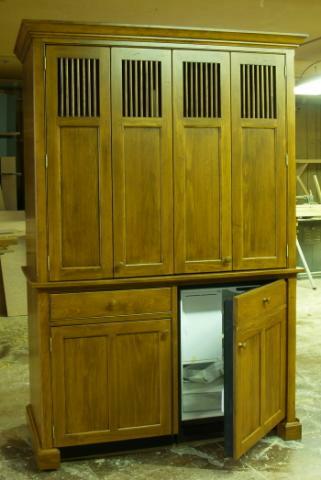 This colonial pine WP54 Hospitality Center includes a refrigerator/ freezer. 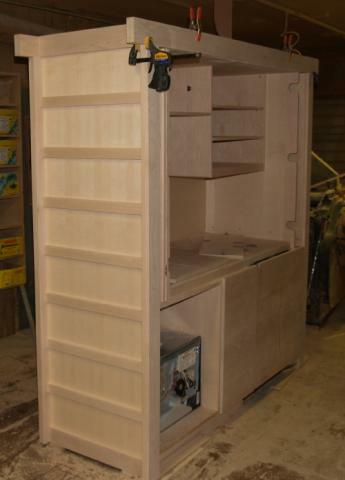 This custom UK72-UK Stealth Mini-kitchen is being pre-assembled and pre-fitted with its built-in appliances. 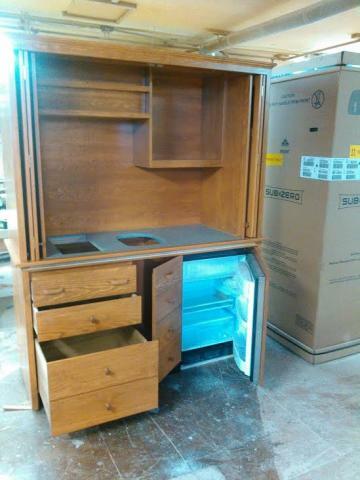 Just before wrapping this UK68B-CSR-MK mini-kitchen for shipping, it receives its final adjustments and inspection. UKSZ-96 Master Kitchen shown here with the top doors closed and the Liebherr 9.2 refrigerator freezer shown open with all the undercounter storage drawers and dish drawer shown open. 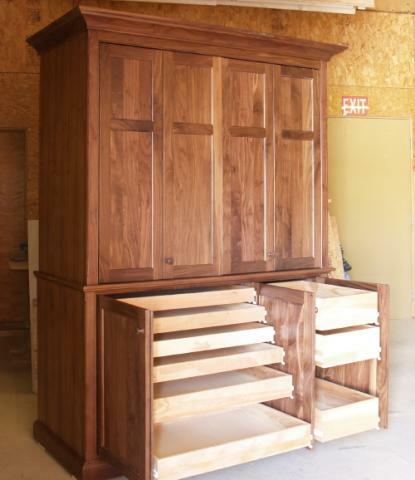 This custom natural Walnut UK68B includes extra roll-out trays to be used in an artist’s studio. 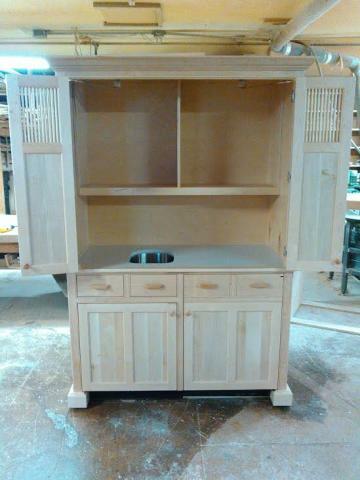 Here is a built-in Hamptons Cherry Mini-kitchen built from two Stealth Kitchen Modules. 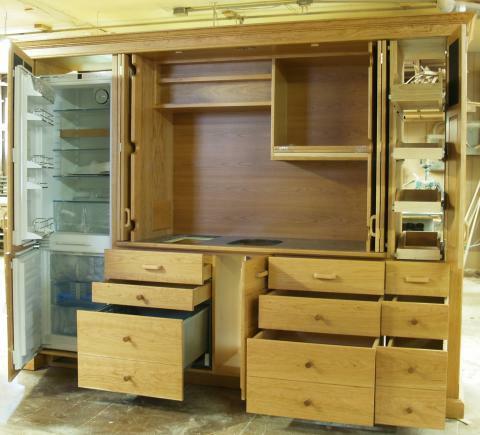 A UK72 (unit with 4 upper doors on the left) is combined with a P18 (pantry unit with one upper door on the right) which has additional refrigeration space below. 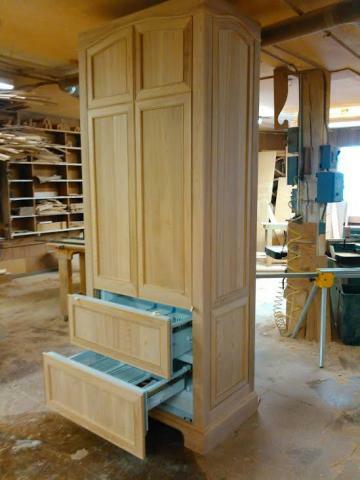 The whole unit includes custom trims which will allow it to stand proud of the wall by 6 inches. 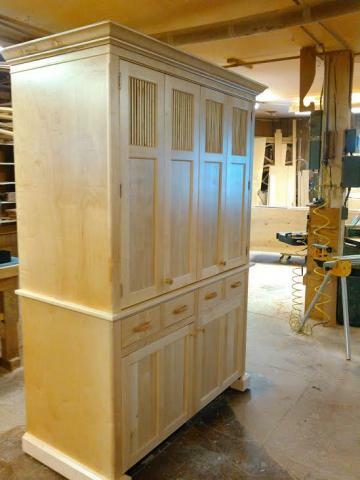 We are in the process of installing the knobs and making final adjustments. Its final destination is a Tudor City studio apartment in New York City. 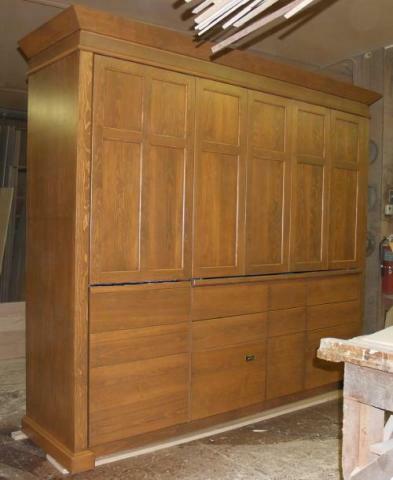 The two images above feature a Natural Maple WP54 Hospitality with flat panel doors with integral dowel vents, a U-Line refrigerator and an Elkay sink. We are just about to wrap it up for shipping. 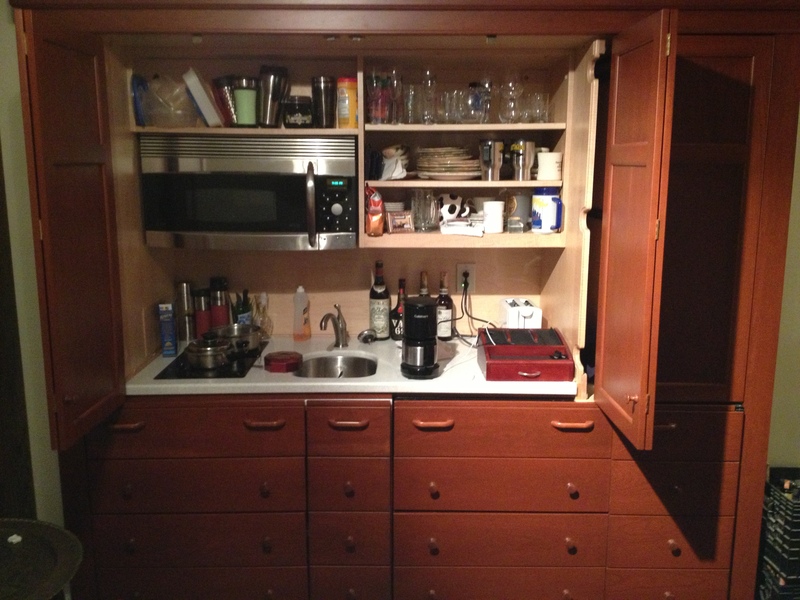 Not shown are the shelves above the countertop. This Custom C72-240 Mini-kitchen features a Gageneau 24″ under-counter oven, a Summit 24″ induction cooktop and an over the range convection/ microwave oven, and a 14″ x 18″ under mounted sink. 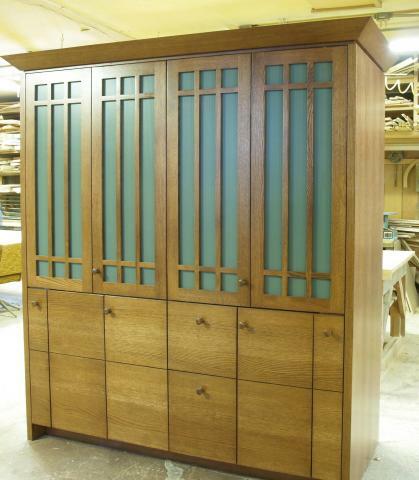 Built of quartersawn oak and our craftsman oak color with custom styled grid doors and a bevel cornice to evoke an overall mission style. 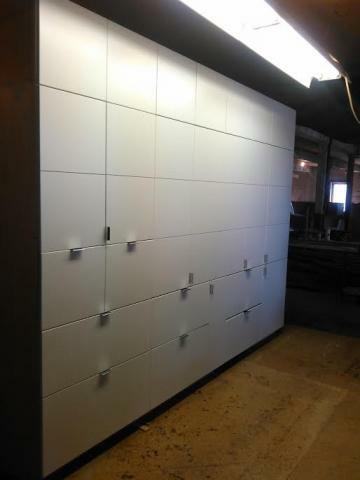 The slim door on the left contain a pull-out spice rack, the one on the right contains slots for trays, baking sheets etc. 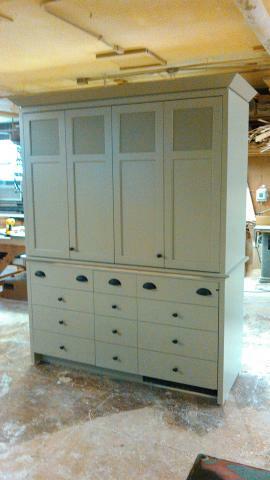 There are also 3 pullout drawers as well as shelving above the hidden countertop. 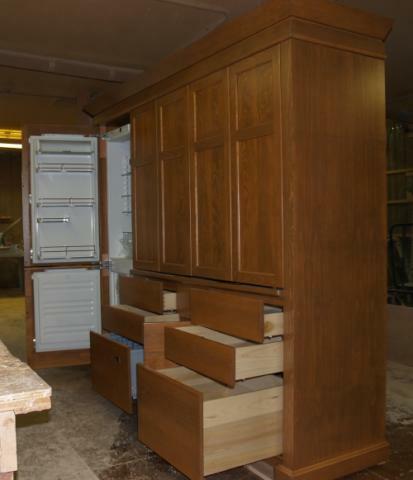 This Custom 108″ tall SZ20-RP-36 Refrigerator features a Subzero IT 36CIID refrigerator/freezer inside a cypress enclosure.The custom profile panels have curved tops as well that hide an upper storage cabinet. The crown molding on top could not be mounted in our shop due to the height of the ceiling. 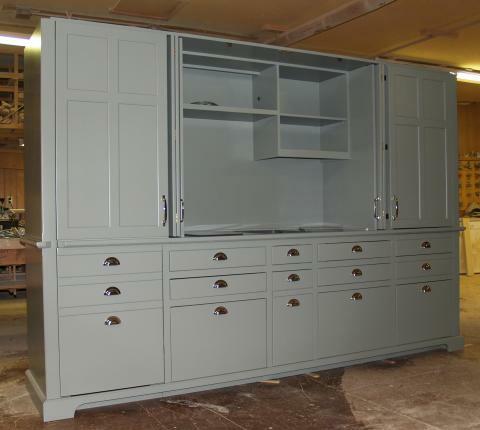 This piece was one of our ‘Gritty Pieces’, meaning that it was shipped from our factory without a stain and finish so that it could be distressed and finished to match the owners existing kitchen. 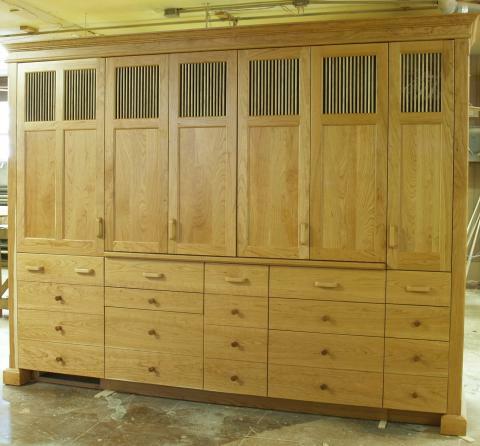 The two images above feature a Colonial Pine UK66-LE (Limited Edition) includes a Summit Refrigerator/Freezer and no single drawer dishwasher. This model is our most popular mini-kitchen and will have a 2 burner 120V cooktop, and over-the-range Oven/Hood and an under mounted sink. Here we are just starting to pack it up for shipping. 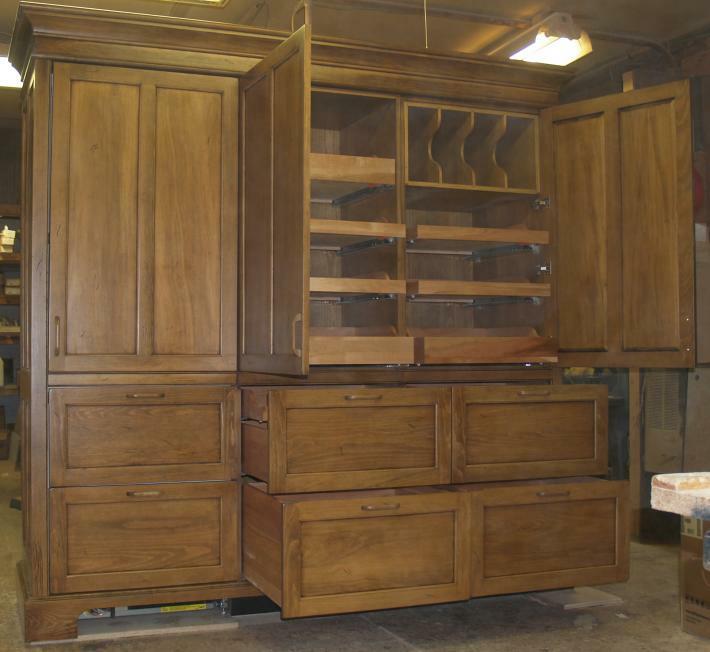 This Natural Cherry Master Kitchen includes a full unit kitchen with two flanking modules added. 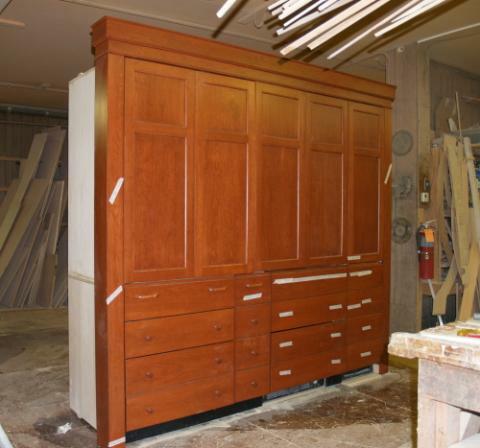 On the left is a Liebherr 9.2 CF refrigerator and on the right is a full height pantry. 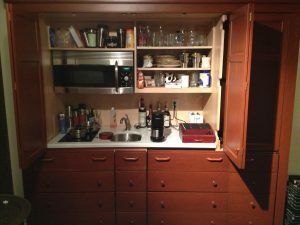 At 105″ wide, this kitchen can truly function as a primary kitchen, with its two burner cooktop and convection/microwave that can cook anything, extra storage, a well appointed refrigerator, and even a dishwasher. 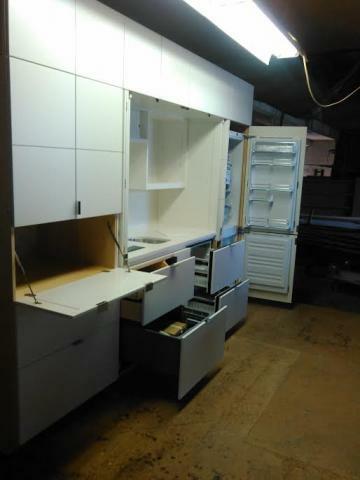 Above and below is a Dover White Stealth Mini-kitchen with a full height Leibherr refrigerator Module on the right and a 33″ wide pantry with a drop down counter-top on the left. 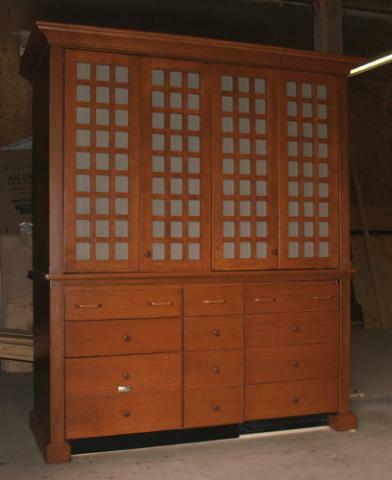 All of the upper door panels conceal 29″ deep storage. Below is a Slate Gray Mini-Kitchen that is flanked by a Liebherr 9.1 CF refrigerator/freezer on the left and a full height pantry on the right. The cornice is not yet installed. This kitchen features a 240V Ramblewood induction cooktop. 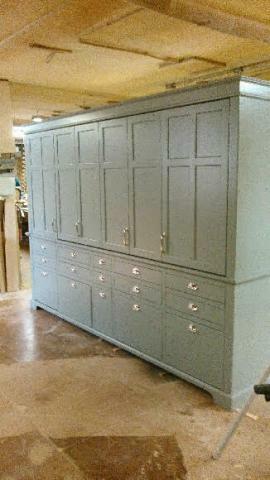 The Polished Nickel cup pulls are the finishing touch that makes this stunning kitchen to truly stand out. The Taupe UK66-LE mini-kitchen below features a beveled cornice, flat panel doors with painted vents and oil rubbed cup pulls. 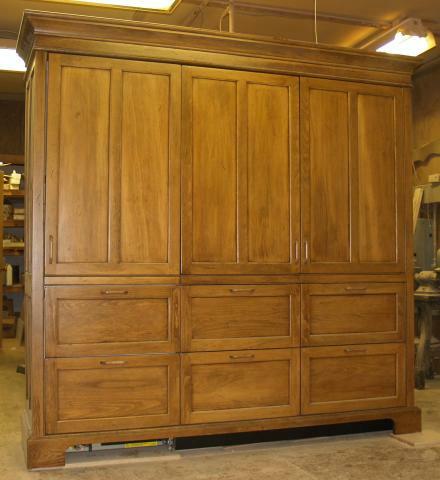 Above, a natural cherry UK66-LE is shown just prior to shipping with flat panel doors and a molding only cornice. Shipping Preparation: The next step for all of our workstations. The job shown above is packed up and ready to be strapped to pallets for shipping across country. We protect all the corners with hardboard corners, then shrink wrap and label them. Some units are bubble wrapped. 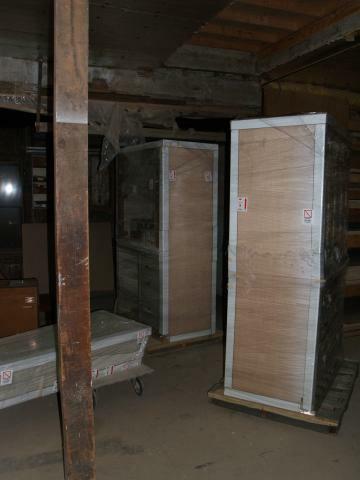 Some units are crated for overseas deliveries. You have the choice of a curbside delivery whereby you provide the labor to remove the items from the tractor trailer, or you can have white glove inside delivery, whereby a delivery crew in a smaller truck places the units inside for you.